Applying for a Passport is the most headache thing for anyone. But, thanks to the Government of India who made this process quite simpler and stress-free. Recently, the Government of India has minimized the procedure length of applying for a Passport. Usually, it has been found that the issuance of Passport procedure is quite hectic for the Government employees, PSU employees or Autonomous bodies and so on. They get stuck in between few documents. The Government employees find it very difficult to obtain an Identity Certificate (IC) or Non-Objection Certificate (NOC). Therefore, to fix this issue, the Government has introduced a new feature called “Prior Intimation Letter”. The applicant who is applying for the passport can just send this letter to the Controlling Authority before the submission of their application. Adopting this action can lead to a faster and less complicated process. Its mainly observed that the Government employees find it hard to issue a Passport. It can be due to the number of documents required or maybe due to the waiting for long long hours in front of the Passport Seva Kendra Office. The old procedure system for the Passport had a lot of things to do. Earlier, the employees have to obtain a NOC Certificate from their employer. Then visit the Passport Seva Kendra for a prior appointment. Then after the NOC is presented and the Passport process still starts to take up. Then the police verification is done at the later stage. But, the latest version is more petite and simple. The Government has reduced some of the privileges and compressed the application procedure. The Ministry of External Affairs adopted this measure since it’s a one-way mode of communication from the employee saying he/she is applying for the Passport. If you are applying for the Passport then you need to submit the “Prior Intimation Letter” to your Controlling Authority or the administration. You need to inform them that you are applying for the passport. If the administration or the authority has any objections, they can directly report them to the Regional Passport Office. The Passport process remains the same as usual. It is the same as that for the regular applicants. Family members of the employees will also undergo the same procedures for applying for a Passport. The Applicants must register themselves in Passport Seva Website: www.passportindia.gov.in. After registering, fill in the required application form and submit. Once the application is successfully submitted, proceed to make the payment. When you are done with the payment, book an appointment. At the time of the appointment, the applicant must be physically present in the Passport Office. After that, you need to collect the token and submit all the documents, provide the biometrics and the photographs. The passport officials will then complete the verification process and issue a receipt. The Passport Verification may or may not be required depending on the documents you submit. Later, after all, above procedures, the Passport is then couriered to your given address. Copy of the Prior Intimation Letter to the administrator or the authority. NoC from the Controlling Authority or the Administrator. Identity from the controlling authority or the Administrator. Debit Cards (Visa/Master Card)- You will be charged 1.5%+ service tax. Credit Card (Visa/ Master Card)- You will be charged 1.5%+ service tax. Passport is a very important document that is issued by the Government of India. The passport certifies the holder’s Identity and their citizenship. This allows a legal permission to travel different parts of the world. For applying for a Passport, we need quite a number of documents to submit. In this article, we are going to provide you all the information regarding the documents that are required for applying different types of Passport. Voter ID with Present Address. Rental agreement if you are staying in a Rent House. Certificate from employer on letterhead with a seal and a signature. Age Proof – one can submit the following documents as the age proof. Birth Certificate issued by the Municipal Authority or any other officer authorized to issue the birth certificate. Age Proof- one can submit the following documents as the age proof. If your parents are planning to issue Passports for the Minors then following are the documents that are required for the Minor Passport Application. Current address Proof in the name of the parents. Original and Self-attested copies of the Parents Passport. This document has to be submitted in the Passport Seva Kendra. Documents of minors should be attested by parents. When the minor turns 18 years old he/she will be eligible for the Non-ECR Passport Category. In this case, the Emigration Check is not required. The documents must be self-attested and should be submitted at the Passport Seva Kendra for the further processing. After the processing of the documents, a declaration confirming the details is mentioned in the application about the minor as per the Annexure “D”. Self-Attested Copy of the ECR and Non-ECR page. A declaration certificate confirming the details that are mentioned in the application about the minor applicant information as per “Annexure D”. Original and self-attested copies of the Passport of the Parent’s. The Parents can attest the documents of the Minor Applicants. Recently, the Ministry of External Affairs has introduced new rules of Passport Application so as to simplify the process. The Ministry of External Affairs has taken interesting steps pertaining to the “Date of Birth” section of the Certificate. The Birth Certificate issued by the Registrar of Births and Deaths or the Municipal Corporation or any prescribed authority whosever has been empowered under the Registration of Births and Deaths Act 1969 to register the birth of the child who is born in India. Transfer/School Leaving Certificate/ Matriculation Certificate issued by the school last attended/ recognized educational board containing the Date of Birth of the Applicant. PAN Card issued by the Income Tax Department with the Date of Birth of the Applicant mentioned. Aadhaar Card / E-Aadhaar card having the Date of Birth of the Applicant. Copy of the extract of the Service Record of the applicant (this is only applicable to the Government Servants) or the Pay Pension Order (Applicable to the retired Government Servants). These documents should be duly attested/certified by the Officer in Charge of the Administration of the Concerned Ministry/ Department of the Applicant having the Date of Birth mentioned. The Driving License issued by the Transport Department of the Concerned State Government having the Date of Birth. Election Photo Identity Card (EPIC) issued by the Election Commission of India having the Date of Birth of the Applicant. Policy Bond issued by the Public Life Insurance Corporation/ Companies having the Date of Birth of the Holder of the Insurance Policy. The Government has changed several other changes making the Passport Application more prescribed and easy. M-Passport Police App– which will help the Police Officers to carry out the verification process. Student Connect– This will allow the students to easily apply for the Passport and different programs. The Ministry of External Officers is adding new features and passport applications each day. A Diplomatic Passport is a type of Passport which is issued to those people who travel internationally and frequently for the Official Trips and State Business purposes and other Government Official Tours and Meetings. The Diplomatic Passport comes in Maroon Cover and in short, is known as “Type D” passports. Official Identity Card of the Applicant or that of the Head of Office. A certificate that has been issued by the Head of the Office. An Official Request Letter from the Forwarding Officer. PMO or Political Clearance Certificate, if needed. Official or Diplomatic Passport: If you are reissuing the Passport then you require Original Diplomatic or Official Passport for cancellation. In this case, it has been kept in the custody that of the Ministry of the External Affairs, the Original Safe Custody or the Surrender Certificate will have to be provided. If in case, this has been canceled by the Ministry of the External Affairs, the Original Cancellation Certificate will have to provide. For Ordinary Passport: Certificate of Safe Custody. If an Official is retiring is less than 6 months from the application date, he/she will have to submit an undertaking from the Office that the Diplomatic or the Official Passport will be given to the Office as soon as he/she returns. A printed copy of the online filled application form. The Re-issuing of the Passport is done when one needs a completely new Passport. The applicant will receive a new booklet along with along with a new Passport number. The Passports are re-issued in cases when the Passport is about to get expired or is expired or if it’s lost or stolen or exhaustion of pages, damaged or soiled passports or change in the personal details. If Passport number is readable, the name is legible and the photo is intact. If the passport is damaged beyond the recognition. If your Passport is damaged or stolen, the first thing that you have to do is file a complaint in the nearest Police Station and to the nearest Post Office or Indian Mission. You need to apply for the Re-Issue of the Passport. An affidavit that gives the information regarding where and how the passport was stolen. Self-attested copy of ECR and Non- ECR page. Address proof- you can submit any one of the following (Election ID with present address/Aadhaar card/Phone Bill with current address/Gas Connection/Bank Passport/Rental Agreement if you are staying in a rented place/ Income Tax Assessment Order/ Water Bill with Current Address. Age Proof- You can submit any one of the following documents as the proof of age: Birth Certificate issued by the Municipal Authority or any other officer authorized to issue the birth certificate. Certificate swore before a magistrate. Self-attested copy of the first and the last two pages of the Passport. Age Proof: You can submit any one of the following documents as the proof of age: Birth Certificate issued by the Municipal Authority or any other officer authorized to issue the birth certificate. The certificate is sworn before a magistrate. Anyone of the following documents: Attested copy of the marriage certificate issued by the Registrar of the Marriages. A joint affidavit of wife and husband along with a photograph together. Self-attested photocopy of the Spouse’s Passport. Proof of the documents that eliminate the cause of the issuance of the Short Validity Passport (SVP). The minor applicants can present their proof of address in the name of their parents. If the applicant is only submitting Ration Card / Voter ID / Aadhaar card as their address proof then they must also submit an extra address document other than that. If the applicant is born on 26th of January 1989 then, submission of Birth Certificate is mandatory. If the applicant is a minor then, Annexure H must be submitted. If the applicant is a Government Employee, then Annexure B and M is submitted. Is Aadhaar Card required for Passport? No, It is not mandatory to provide Aadhaar Card while Applying for a Passport but Aadhaar Card can be used as an Address Proof. Also note that your Aadhaar Card should be 1 year old prior to the Appointment Date at the Passport Seva Kendra. What is ECR and Non ECR Page in Passport? There are two categories of an Indian Passport: ECR and Non ECR, applicant belongs to the ECR Category if he/she has educational qualification less than Class 10th. Applicants having educational qualification above than 10th Class automatically belongs to the Non ECR Category. If you are an Indian, and you do not hold a Passport just because you don’t want to follow the complicated formalities and the procedures, so here comes a good news for you. Taking ahead an excellent workmanship Sushma Swaraj led the Ministry of the External Affairs and introduced some new modifications in the process of applying for a Passport. The objective of these rules is to minimize the complexity in the process of Passport Application. Today in this article, we are going to discuss the new rules which has introduced for Indian Passport Application. Below mentioned are all the amendments that are required for filing a Passport. For the Government Employees: The ones who are currently working can submit a copy of the extract of their Service Record of an individual. And for the retired employees, they can submit the Pay Pension Order with the Date of Birth mentioned. Both the certificates must be duly signed and authorized by the administrator in charge Ministry of Department. Policy Bond issued by the Public Life Insurance Companies/Corporations mentioning the Date of Birth. Name of Mother and Father: Earlier, while issuing for a Passport, mentioning both Mother’s and Father’s name was mandatory. But now according to the New Rule, any individual can mention any one of the following names in the application form: mother/father/legal guardian. Number of Annexures: Previously, there were 15 annexes to be filled as prescribed under the Passport Rule 1980. But in the new rule, you have to file 9 annexures as some annexures have been merged whereas, some annexes (A, C, D, E, J, and K) has been removed. Passport for the Children of Single Parents: Earlier, while applying for a Passport providing names of father and mother was mandatory and both the names should be printed on the passport. But according to the new rule of Passport issuance, the single parents who want to issue the passport for their children have an easy application form. They can also even file a request for not printing the name of the father and mother in the passport. Attestation of the Annexes: Earlier, there was a rule that all the annexes that was prescribed under the Passport Rule 1980, must be attested by any Notary/ First Class Judicial Magistrate/ Executive Magistrate. But according to the new rule, all the annexes can be submitted self-declared on a plain paper and no attestation is required. Marriage Certificate for Filling a Passport: Before, the Annexure A or Marriage Certificate was compulsory during the issuance of the Passport. But in the new rule of issuing a passport, there are no such obligations and a married couple may file for an Indian Passport without a Marriage Certificate. For Divorced or Separated Person: Earlier in the old Passport Rule, the divorced applicants were forced to mention their spouse’s name while issuing for a Passport whereas, in the new rule the divorced or the separate applicants can file for a passport without mentioning their spouse’s name. Orphaned Children: Earlier, the orphaned child was supposed to submit proof of date of birth like Birth Certificate or Matriculation Certificate or a declaratory letter by the court mentioning the Date of Birth. But in the new rule, a letter declaring the date of birth of the Orphaned Child in the letterhead of the Orphanage which is attested by the Head of the Orphanage is acceptable while issuing the passport. No-Objection Certificate for the Government Employees: Earlier, an identity certificate (Annexure B) or a Non-Objection Certificate (Annexure M) from the employer was a must for an Indian Passport. Whereas, according to the New Passport Rule the Government Employee who is seeking for a Passport can just submit a self-declaration in Annexure N, stating that he/she has been given a prior notice to the Head of the Department that he/she is applying for the Passport. Passport Rule for Sadhus and Sanyasis: Earlier, according to the old passport rule the Sadhus and Sanyasis had to mention their parent’s name. But according to the new rule, if the Sadhu or Sanyasi want to mention their Guru Name then they have to present at least one of the following documents- Aadhaar Card, Election Photo Identity Card, PAN Card etc. that has the name of their Guru mentioned under the Header of the Parent’s Name. Introducing these new rules have made the issuing of the Indian Passport for easy and clear. A Passport is an Official document that is issued by the Indian Government. The Passport certifies a holder’s identity and citizenship and allows them to travel anywhere under its protection. In this way, the Passport is used as a Travel Document. The Passport also serves as an Identity Proof and Address proof and can be used in many cases such as while buying a house or taking a loan. Applying for a passport is a long process as it includes paying frequent visits to the Regional Passport Office (RPO). Therefore, to make simple the Ministry of External Affairs has introduced an online application process so that it can be easy and convenient to use. Visit the Passport Seva Official Portal. Click on the “Register Now” link present on the homepage. Sign up and Log in to the Passport Seva Online portal using the login credentials. Click on “Apply for fresh passport/re-issue of the Passport” link on the page. Enter the required details asked in the online application form and submit it. Go to the “View saved/submitted applications” tab and book an appointment for the PSK Office (Passport Seva Kendra) or Passport Office. Make the payment to complete the appointment booking. The payment can be done online as well as Offline. Payment can be done through (debit/credit cards, internet banking or State Bank of India Challan). Print the application receipt, the receipt includes the application reference number and appointment number. Visit the Passport Seva Kendra/ Passport Office with the application receipt and all the required documents. The Passport Seva Kendra are the service centers for the Passport and its related issues. Here the applicants can submit their documents and complete the additional formalities. Generally, a fresh Passport cannot be filed in the PSK without an appointment until and unless it is an urgent case or Tatkal passport, or the applicant is a handicapped, minor or a senior citizen. All the other applicants are requested to schedule an appointment and visit the Passport Seva Kendra on the appointed date. Buy an application form from the Passport Office or download it from the Passport website. Now submit the filled in application form along with the supporting documents in the Passport Office. A file number is generated or issued after the submission of the application form and the documents. Pay the mentioned processing fee, after that the application will be processed. 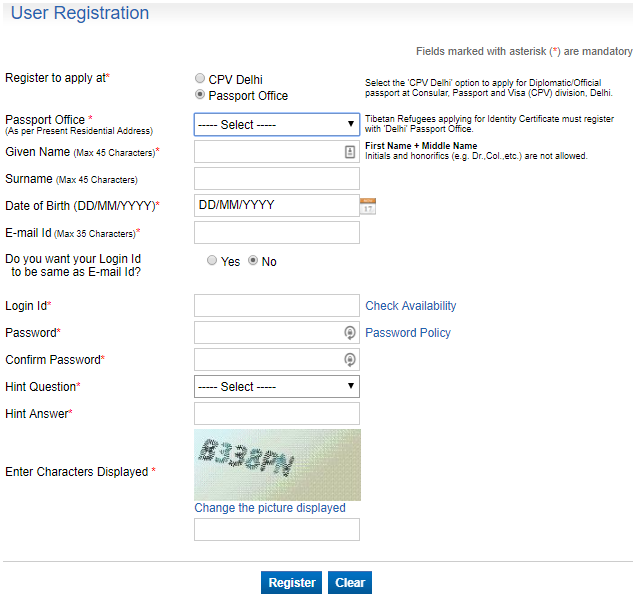 You can track the application form on the Passport website by mentioning the file number. After the successful verification and processing, the applicant is then notified and can collect the passport in person.